Valentine's Day often conjures up visions of romantic dinners, lots of wine and chocolates. But it doesn't have to always be so traditional. Why not celebrate the love you have for your significant other, friend, family member, or yourself by working out? As Move Ya Brass member Carey Brassette told us about exercising with her husband Edward, "We realize that working out together is a commitment, just like a loving relationship. Sometimes your partner may not be at the same level of fitness as you, but with encouragement and support they can continue to work towards their goal." The Brassettes have been dedicated Move Ya Brass members for the past two years. By joining our running group and coming to our Bounce Ya Brass and Twerk Ya Brass classes, they find the support they need to keep going from each other as well as the rest of the MYB Krewe. "Without Edward’s encouragement I probably would not have continued to run or workout," Carey told us. "With the support of Move Ya Brass, Edward has completed his first half marathon and I continue to work on my running and twerking skills." Join Carey and Edward Monday night at 6:00 PM at Crescent Park for our weekly run along the Mississippi River. You can also meet at the Mandeville Trailhead for a Northshore run led by another MYB couple — Ryan and Jennifer Cardinal — at 6:15 PM. You don't have to be coupled up to join us though. Bring a friend or come solo! 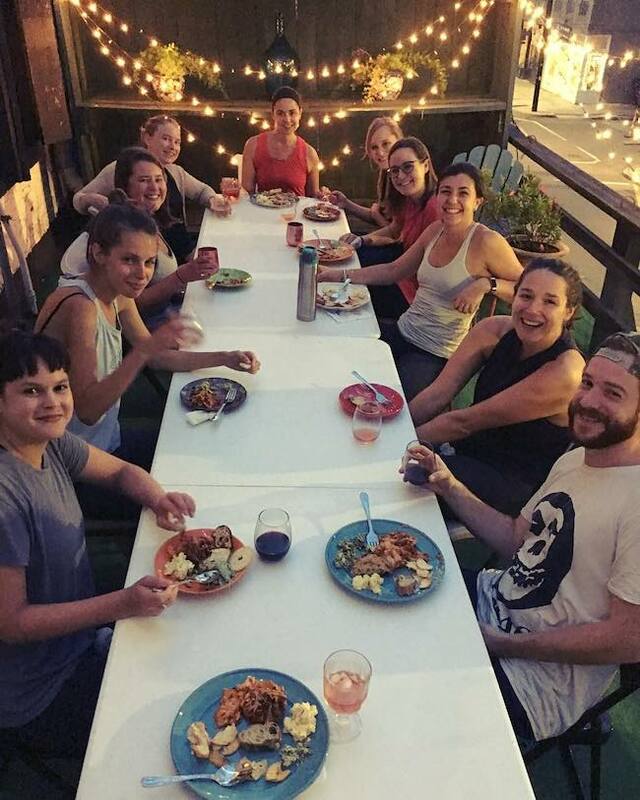 Since wine and Valentine's Day go hand in hand, why not celebrate the holiday early at Nola Yoga Loft's weekly Vinyasa & Vino potluck? After the all levels yoga class, food and wine will be shared. Keep in mind, while some provisions are provided, they’re limited so contributions are encouraged! It's the perfect way to celebrate your love for your favorite yoga buddy, or to meet new ones. The Lower Garden District studio hosts the $20 event from 6:30 – 9:30 PM every Tuesday, continuing the love beyond Valentine's Day. There's more wine to be had as a reward for your hard work the day before Valentine's Day. After their 45-minute 6:30 PM indoor cycling class, stick around for Cycle Bar's happy hour. Enjoy a glass of wine and get to know the people you just sweated with at the Uptown studio. Standard drop-in rate is $25 or ask about a first-timer discount. After wining down on Wednesday, come back to Cycle Bar on Valentine's Day to sweat it out no matter where you are on the love spectrum. Their indoor cycling classes will be set to the tunes of Dynamic Duos at 8:45 AM and Love & Hip Hop at 4:30 PM. You can then join the I Heart You Ride at 5:45 PM or a Breakup Ride at 6:45 PM if you're not feeling the love. Bring a friend or cycle up solo to the beat of whatever type of relationship you are in. The Valentine's I Heart Yoga Flow is a hot yoga class with “a little emphasis on love and heart openers.” The hour-long, all levels flow will be set to Valentine's Day inspired music at Free To Be’s New Orleans, Old Metairie and Morgan City locations. The best part? You can bring your favorite Valentine along for free. Drop in classes are $20. Celebrate your love of our four legged friends at Louisiana SPCA. Led by NOLA Tribe Yoga, you'll stretch, plank and high lunge while kittens crawl under and over you. But they're adorable so you won't mind. If you happen to fall in love with one of the spayed/neutered, vaccinated and microchipped felines, you can adopt it and take it home with you. You must pre-register for the $20 Yoga with Kittens class that is held monthly from 9 – 10 AM. Mats are available to rent. They say being in nature is good for the soul. So, end Valentine’s week by honoring yourself and your love of running by going off-road with us. Each Sunday is a different trail. Check MYB Trailblazers Instagram for exact times and locations. Do you have other fitness inspired Valentine's Day plans or suggestions? Tell us below?